I finished anime series of Ace of Diamond. I don't know baseball and i don't like it either. I generally disliked all characters in the anime. The releationship between the main character and side character was so bad. It was like 5 times weak version of Sakuragi & Rukawa of Slam Dunk. You know in every sport anime there is always a hardworker improving newbie and an already progidy talented rival. But this was the worst one because i hated that rival. It didn't shine himself but he also overshadowed main character. For Slam Dunk Sakuragi wasn't overpowered by Rukawa but Rukawa shined himself too. They give big attention to main character's designing but the other characters looks were bad. More than highschool students they were like adult men. I hated all rival school teams. They were so annoying. 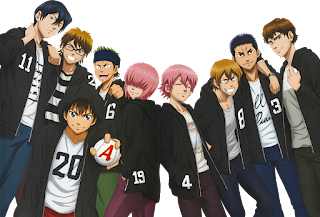 That pink haired guy reminded me Fuji from Prince of Tennis.